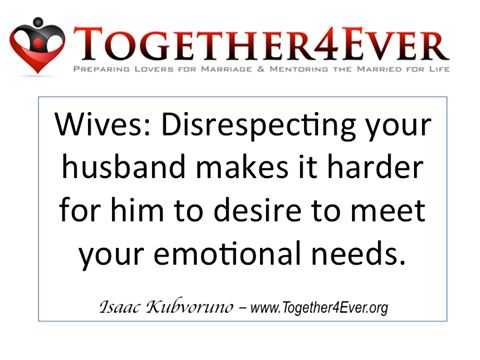 Are you in a relationship where your emotional needs are not being met? 1st question to self: Have I communicated them clearly? Just because you told him about it during an argument doesn’t mean it actually registered. He probably was busy preparing his defense. Also, keep in mind that women speak a different language than men so if you said it in a way only another woman would understand you might need to rephrase and restate it. I told him 3 times already, I shouldn’t have to tell him again DOES NOT solve the problem. Saying I told him already doesn’t mean anything if it didn’t register especially if you said it when you both were heated. I mean, is the goal to pride yourself on him not knowing so you will always have something to throw up in his face when you are arguing or is it to have your man meeting your emotional needs? 2nd question to self: Am I careful to be a Respecter? Before you say your resounding YES! Do you definitively know what HE considers R-E-S-P-E-C-T? Have you ever actually asked him? Do you know the things you say or do that you think are ok but may represent blatant disrespect is to him? Well, that’s just the way I am, he’s just going to have to deal with it. DOES NOT solve the problem. I’ll make it personal. When I first met my wife she was a single mom who was used to doing things on her own. She had been burned by her daughter’s father, so she developed a habit of doing certain things herself from being alone. So when I took her out on a date and the waitress met us the door, without a second thought she would step out in front of me and start talking to the waitress for our seating. To a woman, this may seem like such a trivial thing. You may even say my man doesn’t care, he has never even said anything. If you don’t get anything else from today’s broadcast, understand this clearly! It’s the little things that add up. So if you have clearly stated what your #emotional needs are in a way that HE understands and you still are not having your emotional needs met, it might be time to take a serious look at the level of respect you exercise in your words and actions. I’m not suggesting that this is always the case. No am I attempting to shift blame for the bad behavior of SOME of my brothers. Sometimes we men can be uncaring and insensitive and clueless about how to love a woman but if that is not the case with your man. If you have experienced him successfully meeting your emotional needs from time to time and you know it is in him to do it but that side of him is noticeably absent. If I were a betting man I would say that you have contributed to his LACK OF DESIRE to fulfill your emotional needs through your disrespect whether knowingly or unknowingly. “Examine yourself and see if you be in the faith. Previous articleAre you a Queen or Nah?